Intriguing things are happening in Presidency University once again. 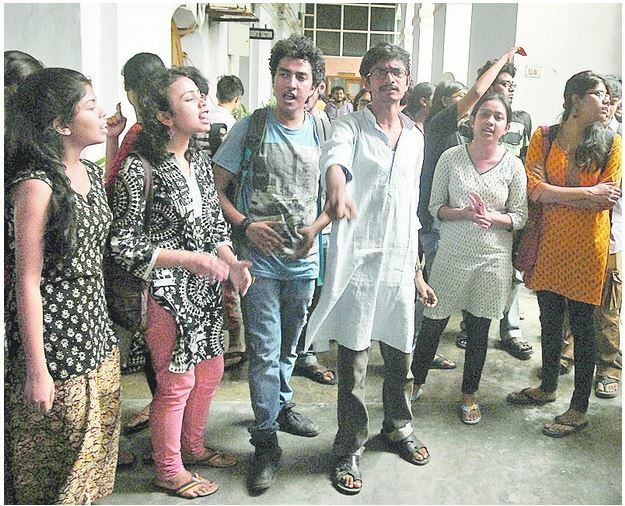 Students laid a night-long siege, demanding from the vice chancellor and other officials a uniform procedure across all disciplines for entry into the university. Having grown up in a world where infants barely out of their cradles are subjected to admission tests, their demand can hardly be described as unnatural. In fact, the very removal of an admission test itself may appear to them as a denial of a fundamental right. On the other hand, the right to “deny” clearly rests with the authorities in charge of running the institution. And the authorities do not appear too excited about the idea of admission tests. Nothing unnatural in this either. The institution lacks the necessary infrastructure as well as internal faculty strength to carry out the exercise. As far as the scarcity of examination halls is concerned, the matter may presumably be attended to by renting in premises for the purpose. This procedure is not unknown, since it is a policy that many other reputable institutions follow. The faculty shortage difficulty is less easily addressed, especially since the university aspires to represent the quintessence of academic attainment. Academically outstanding people are usually not available on lease to evaluate admission-test answer scripts. Committed academics, with proven excellence, need to be located instead and shifted to the university as permanent employees. The university has succeeded to an extent in attracting such talent, though not fully so. Several faculty positions still need to be filled up and the VC cannot be held responsible for not being able to fulfil an impossible dream. If media information is to be relied upon, the administration is engaged in discussions with the student body to find out possible ways of escaping the impasse. While that process is on, it is not entirely irrelevant to reflect upon the history of admission tests in the erstwhile Presidency College. Prior to the mid-Seventies, the college did not conduct admission tests in a majority of departments. In particular, the science faculties depended solely on the “cut-off mark” criterion to determine the quality of students. At the same time, there were departments – such as economics, English and history – that did conduct admission tests. In this columnist’s perception, they did so primarily to judge the applicants’ command over the English language. Indeed, he was himself asked to write an essay on a subject quite unrelated to economics to prove his worthiness to being admitted to the economics department. It was a weighted average of the marks obtained in the admission test and the immediately preceding university or board examination that determined a candidate’s eligibility. However, as noted earlier, most departments, including physics and geology that housed the cream of the student body, felt no need to arrange for admission tests. And neither students nor the faculty ever complained of any massive damage caused on that account. The college resorted to conducting admission tests for a majority of departments (possibly all of them) around the second half of the Seventies. As far as a teacher from that era can recall, the practice began in the year 1976 – that is, at the fag end of the Siddhartha Sankar Ray government and a year preceding the Left Front capturing the Writers’ Buildings. Thus, the Left Front, even though it has been accused of making a fetish of mediocrity during its tenure, was yet to take charge of the devastation of education in the state. The state, however, was passing through a period of instability in the mid-Seventies and the Ray government will go down in history for precipitating a holocaust on teenagers of the time. How education suffered in those days is a matter of speculation perhaps, though many feel that the manner in which board as well as university examinations were run during the troubled times had little to recommend for itself. It is tempting to extrapolate from this observation that the college in its entirety began to question the merit of relying on the marks secured in higher secondary or similar examinations alone to judge the quality of entering students. It is possible, therefore, that the college authorities decided, and decided rightly, to initiate admission tests in most departments, to ensure internally as well as externally the quality of the students being admitted. And this practice has continued ever since. In the meantime, with a stable government in place, the lawlessness surrounding board examinations was gradually brought under control, but this did not impact the authorities’ decision at Presidency College to conduct admission tests. There were two reasons it would seem why the college did not feel over-constrained to carry out the task. First, it had not yet graduated to a university and second, there was no shortage of faculty. The size of the institution was, therefore, substantially small and the size of the faculty adequately large. Consequently, there were few difficulties surrounding the handling of admission tests. A pertinent question might nonetheless be raised in this connection. If indeed the school leaving or other examinations had turned into a peaceful affair, why did Presidency College not revert to the earlier cut-off point system in the science departments at least. And the answer probably lies in the Left Front government’s morbid decision to view academic excellence as a form of exploitation by the so-called elite class. Means were devised to remove the potential sharpness of examination questions to distinguish the bright from the non-bright. These devious machinations engendered the all-too-familiar tutorial homes that not only substituted for classroom instruction, but even made the latter irrelevant. A solid drilling in tutorial homes was a sine qua non for students to perform with so-called brilliance, though the brilliant performers were practically indistinguishable from one another, a phenomenon reminiscent of a scene from Satyajit Ray’s Parash Pathar, where each participant in a dance show was awarded a gold medal. Unfortunately, a similar flattening out process was underway among the ranks of the faculty at the college too. It is a wild guess perhaps that the college perceived that higher secondary marks secured by a candidate seeking entrance into it were not adequate indicators of quality and, hence, an admission test was in order. Alternatively, the continuation of admission tests even after social violence was well under control could be an indicator of bureaucratic inertia induced largely by an unimaginative faculty. In any case, given the mediocrity of average faculty members (though not all of them), one wonders how promising candidates were picked out of the flock of tutorial-home-trained indistinguishable students. One suspects that admission tests were not serving any purpose at all. This does not mean that the college did not have its pool of competent students. It was a case of serendipity perhaps that ensured that a reasonably large number of meritorious students continued to graduate out of the college. Whatever the true state of affairs might have been, there is little doubt that conducting admission tests for the much larger Presidency University now is a Herculean task. Whoever might be advocating that cause needs to realize that admission tests for all the departments cannot possibly accomplish the purpose for which the tests are designed. Till such time that infrastructure issues, and this includes faculty recruitment as well, are resolved, there will be no way of judging if an admission test supplementing a cut-off criterion will be more potent than the cut off alone. Of course, tutorial homes still thrive merrily. Hence, a simple cut-off score may not solve problems either. Moreover, the issues motivating the students’ admission tests agitation continue to remain a grey area. All these confusions notwithstanding, Presidency University needs to view as well as project itself as a centre for super-excellence. And therein, alas, lies the rub.